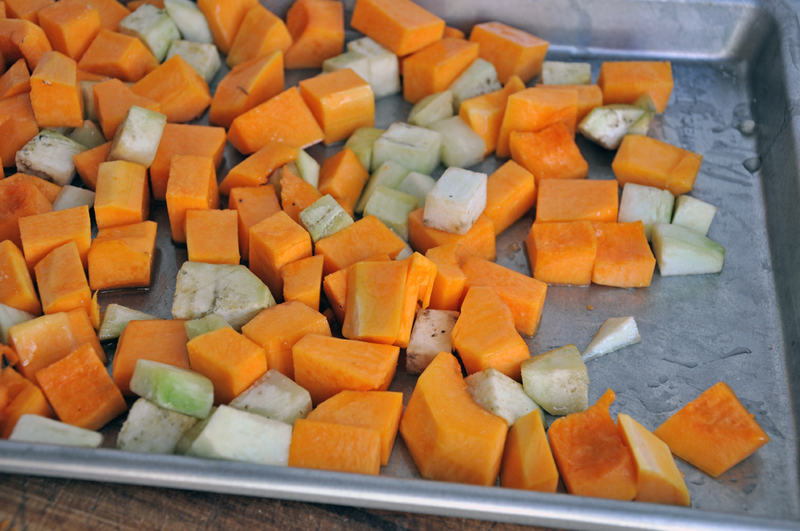 Toss squash and eggplant with 2 Tbsp oil and spread out in a single layer on a baking sheet. Roast 15 minutes, and then remove to let cool. In a small bowl, whisk together soy sauce, rice vinegar, garlic, sesame oil, and brown sugar. Set aside. Bring a pot of salted water to a boil. Drop in the noodles, cook 2-3 minutes until al dente, drain and set aside. In a large skillet, heat the remaining 2 Tbsp oil over medium-high heat. 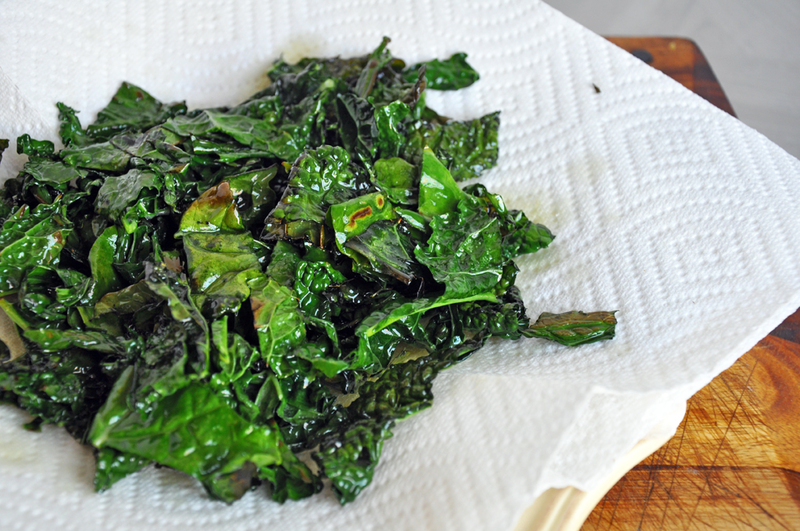 Fry the kale 2-3 minutes until crispy and beginning to brown. Drain on a paper towel-lined plate. To assemble, toss the squash, eggplant, noodles and soy sauce mixture together in a large bowl. 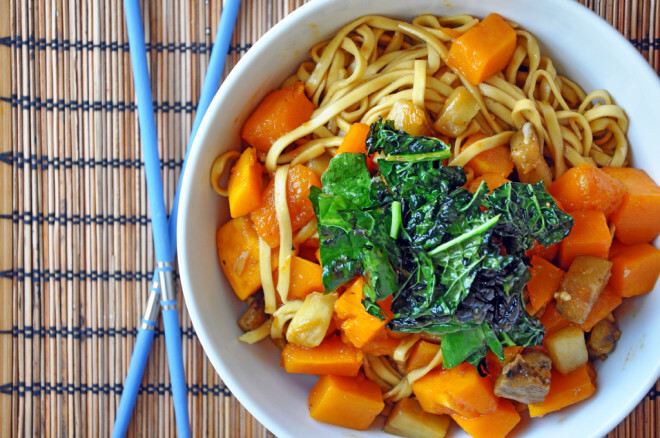 Divide equally in to four smaller bowls and top with crispy kale. This sounds great and thank you for all the yummy recipes. I have a question about eggplant. Do you usually peel it? And, do you de-bitter it? I’m from Greece and I often make moussaka, and I’m always wondering if I should de-bitter the eggplant. By the way, I’ve used Lite-Life’s substitute ground beef and it comes out great. Another time, I used Lite-Life sausage and a green-pea based ground beef (don’t remember the brand) and it was good too. Katherine, Thanks for your note! I usually peel and/or de-bitter eggplant if I’m going to fry it. BTW, I de-bitter by slicing, laying in a single layer in a colander, sprinkling generously with salt, repeat and let drain in a sink for at least an hour. Then I pat dry with paper towels before using. But since in this recipe the eggplant was roasted, I didn’t bother. Also, I have a great vegetarian moussaka recipe here: http://www.vegetarianized.com/2008/04/margys-vegetarianized-moussaka/. I hope you’ll try it!